Petits Creux (Little Hollow, in English) started out as a Corsican restaurant based in Quebec City. Their customers and regulars asked for a little taste of Corsica to take home with them, which inspired owners Marie-Pierre Tomasi and Kim Colonna to launch their line of terrines and confitures. 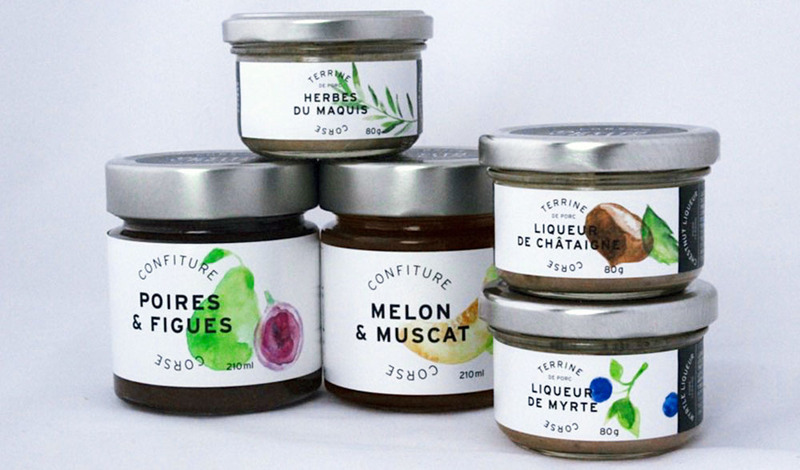 The Petits Creux product line includes pork pâtés (terrines) and jams (confitures). All of these products are made with a combination of locally-sourced ingredients and ingredients imported directly from Corsica, such as fruit liquors, wild herbs and Cap Corse muscat. The taste of Corsica comes through. We tasted three different products – two terrines and one confiture. Here are our notes. Made with strawberries, sugar, a nepeta infusion, pectin and lemon juice. Nepeta, for those who don’t know, is a flower genus. The jam smells of tart red berries and strawberry with a sweet note at the end. It tastes slightly tart, not overly sweet. The strawberry flavour comes through nicely without being overwhelming. As a jam, it’s a bit watery both in texture and flavour, but satisfies the fruit craving. Made with pork, poultry liver, eggs, water, French grey shallots, myrtle liqueur, cornstarch, salt, myrtle flavouring and pepper. Myrtle liqueur is very popular Corsica and Sardinia liquor made with myrtle berries. It is fresh and light with subtle pâté flavours. It is reminiscent of tuna fish or flakey canned chicken. The palate leads with creamy chicken and spices and ends with a salty kick. Texture wise, it’s grainy, crumbly and hard to spread… which is unfortunate if you prefer to eat your pâtés on crackers. Made with pork, pork liver, eggs, French grey shallots, cornstarch, water, brandy, salt, Maquis herbs and pepper. Maquis herbs are wild herbs that grow all over Corsica. These include thyme, juniper, myrtle, oregano, basil, and multiple varieties of mint. Maquis herbs bring a unique taste to Corsican dishes. Herbes du maquis is flavourful and slightly sweet at first taste, with notes of herbs and a creamy flavour on the forefront. Pork takes over in the finale, then it goes a bit bland. Enjoy with crackers; the saltiness is a nice balance to the sweeter notes of the terrine. It is grainy, stiff and tough. Like the other terrine, it’s not very spreadable. In addition to these three products, Petits Creux also has Pear and Fig jam, Melon Muscat jam and Pork Terrine with Chestnuts.